I did a twistout this past weekend and I’ve been retwisting it dry every night. It was just this weekend that I realize that my hair has grooowwwnn. I don’t know if it went through a growth spurt, but it seemed significantly longer that I remember it being. Maybe I didn’t realize because I haven’t twisted it in a while because I’ve been bunning, but wow! It’s getting longer by the day because its stretched from the retwisting. It’s getting fluffier by the day because of the rainy weather. Many people even commented on how much my hair has grown, or how quick my hair has grown, so it’s not just me. I can even reach my hair in the back to stretch it down now! I guess I can finally make my length check t-shirt. Rece, I like this look. Your hair is fluffy and big. I think this is what Shelli was talking about. The BIG FLUFF. Very nice. Hey, my reply is missing! Marsha, this is EXACTLY what I was talking about!! I replied earlier today and said, YES!!! This is exactly what I wanted, big, fluffy hair on you!! It has grown a lot, but I think the stretching is what is really showing off your well-earned length. LOVES IT!! OMG Rece it looks fabulous. Looks like your hair is growing faster than the average .5 inches a month woo hoo! 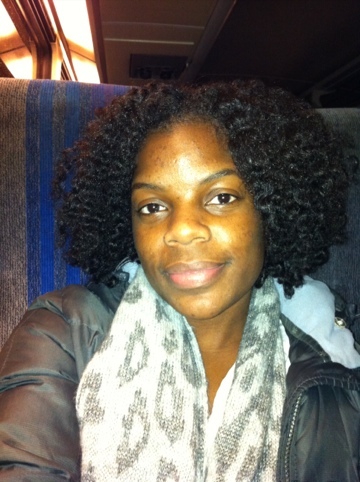 That Twist Out is NICE!!!! Looking good Sherece. Hey lady…length is looking good! Thanks! Can’t wait to see yours!